Stanford, Calif. - Freshman Patrick Rodgers won the Olympia Fields/Fighting Illini Invitational last week, carding rounds of 68-70-68 (206, -4). Rodgers met the team in Illinois after returning from Aberdeen, Scotland, where he competed in the Walker Cup. He became the first Cardinal golfer to win his first collegiate tournament since Tiger Woods accomplished the feat 17 years ago. Battling rainy weather on the final day, Rodgers made two birdies and had no bogeys to win the tournament by three strokes. He led Stanford to a 16-stroke victory over an impressive field that included 10 Top-25 teams. You only had a few days between the Walker Cup and the tournament. How did you prepare for your first college competition? "It was pretty hectic. Chicago isn't too far from my hometown (Avon, Ind. ), so I flew home, got my game ready to start college golf and went up and met the team. In my mind they were two totally different events. The Walker Cup is one of the highest honors you can receive in amateur golf and to be a part of that team was really special. It was a long and emotionally draining week because you put so much into the competition; you're playing before 8,000 people and they're all rooting against you. On the flight home I had time to reflect and re-focus and I was ready to get to school and start college golf. After the Walker Cup I knew I could compete in college golf and I just focused on playing well at Olympia Fields." 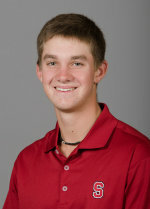 The last Cardinal golfer to win their first event was Tiger Woods. What was it like joining that club? "Any time you're compared with him in golf it's a good thing. It's a big accomplishment, but I feel that college golf is more of a team event. The goal is to win as many events as we can as a team so to start off with a 16-shot win as a team is pretty good and I'm just happy that I could help the team do that." You met a lot of your teammates for the first time at the tournament. How did they welcome you into the group? "I met a few of the guys on my visits and we had a great experience at the tournament. Everybody's happy that we won and that lightens the mood a lot. The freshmen are going through the normal stuff, having to carry the bags and all that. Maybe my performance puts a little target on my back for some of the upperclassmen that didn't like me beating them but I'm sure they'll use that as motivation. I know that they'll get their fair share of wins this season later in the year, we have a lot of great players on our team." You shot a final-round 68 in the rain. How were you able to accomplish that? "It was a good steady round. I made a lot of pars and I missed a few birdie opportunities early but I made a few coming in. Something I took from that round and the tournament was that I could win without playing my best golf. Coming off the Walker Cup I didn't have my `A' game and I didn't have much time to prepare. I was really proud of the way I was able to scrap it around and score my golf ball without hitting it great. I struggled off the tee all week and I was able to manufacture some shots and score and play consistently. I only hit about 35 percent of the fairways and I had four bogeys for the week so I can take a lot of positives from that. I realized that I can compete and win at this level without having my best stuff." "Why not? It's an awesome place, perfect weather, great academics, great coaches and first-class facilities. It was a win-win situation for me. I'm excited to be here." Here's a link to the GoStanford.com article.